We believe every child deserves to grow up in a family, loved and cared for to thrive in life. Unfortunately, this was not the case for Natasha and her two siblings, Blessus and Pendo. The three children come from a single parent family, their mother suffered with mental health issues as a result of growing up in an orphanage herself. It is unfortunate that her condition led to people taking advantage of her and she was abused sexually resulting in an unwanted pregnancy. Natasha was born and brought to Kandara children’s home by an uncle 3 weeks after she was born since the uncle was young at the time and had no idea of how take care of an infant. Coincidentally, Blessus who is Natasha’s older sister was also being cared for at the baby unit and it is believed that the same uncle had brought her some years back, also as an infant. The two little girls grew up together knowing they were siblings as the house mothers took the liberty to build bond between them, hence they loved being in each other’s company. In the four years that Natasha lived at the baby unit, she grew up as a beautiful, healthy and cheerful girl who was loved by all. She started schooling in the early childhood development centre constructed by Raising Futures Kenya within the children’s home. We came to learn about the detrimental negative effects of institulization of children and embarked on a journey to reintegrate these two siblings, among other children, back to their families so they would have the opportunity to grow in family and community. 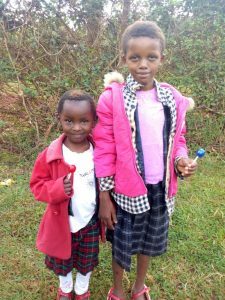 There was anxiety from the orphanage care givers and the uncle who had brought the children, but what was certain is that the girls needed a place to call home and a family that would love, care and protect them. The vulnerable child support programme led by Winfred began intentional engagements with the family of Natasha and Blessus and worked in collaboration with the children’s officers, care givers, the orphanage social worker and matron to reach out to the uncle who had now settled with his own family. There were numerous meetings, counselling and psychosocial support children as part of preparation for reintegration. These sessions led the team to a new discovery of another sibling related to the two girls who had been placed in a different orphanage. Pendo is their older brother and it is believed that he was born during the time his mother lived in an orphanage. A decision was made to reunite the boy with his sisters, this involved visits to the orphanage where the brother had been placed and through working with the administration and social workers, the children were allowed to visit each other and spend holidays together which eventually led to moving out of the orphanages permanently to their uncle’s home. This was one of the best moments for Winfred who was in charge of reintegration of children and this is what she said, “it was a beautiful journey that took more than three years but had a happy ending”. Our staff have continued to be in close communication and monitoring of the children through regular visits to the home, bringing all the reintegrated children together over the holidays and conducting visits occasionally to ensure the children’s welfares are not compromised. Natasha and her siblings now enjoy living in a home with their uncle, his wife and a cousin of the same age as Natasha. The uncle is so proud of them and he enjoys teaching them, nurturing and providing for them, something he missed as he also grew up in an orphanage. Our future plan is to empower and strengthen these families economically so that they can be self-sustainable to take full responsibilities in raising the children.